Every once in a while some filmaker comes along and decides to embark on making thier vision come to life despite not having a studio to back them up. They utilize the surroundings and local talent to put together a grand opus of celluliod. I’m talking, of course, about RAZOR SHARP. (Obscurus Lupa fans will unite in big chuckle anyway.) No! I’m talking about the vastly supior film entitled INK. Lemme kill two birds with one stone for you and also introduce you to Apollo Z Hack. 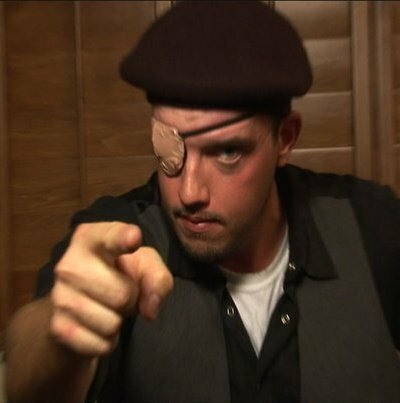 He’s the internet reviewer prodigy that opened my eyes to the film. Apollo is a forced to be reckoned with in the world of webisodic reviewing nerdy goodness. I should do an article all about him. Just do you self a favour and if you are anything like me you will appreciate his work. 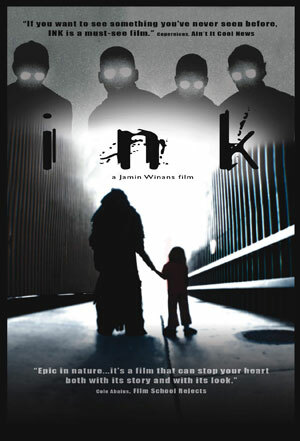 INK is a thouroughly unique film that has a story which takes it’s characters on a quest through time and space! Sounds EPIC doesn’t it? It is. What’s great about it is that they manage to put such scale and urgency into the story with what little they have you kinda wonder why Hollywood, with it’s infinite amount of money, can’t do the same that often. This film is the Inception of backyard filmaking. It’s conciet a simple one. Good versus Evil in it’s purist form. If you like fantasy drama this one is for you. I’m a christian man and I couldn’t help but see the delicious paralell between this film and the spiritual battle we face in our day to day lives being acted out on the screen so clearly and cleverly! For those of you unfamiliar with spiritual battle see .. the Bible. After you are done reading pick this movie up and be amazed what a brilliant metaphor it works as. It almost works as a teaching tool. But whether or not you are a christian doesn’t change the enjoyment of this picture. It’s got great fight choreograghy some pretty good acting across the board. (which is rare by the way) The film is just plain visually appealing. Which again is rare in a movie made for so little. Do me a favor and checkout the link. Apollo Z Hack gives you the Hack Down on this excellent feature leangth adventure. There he gives you some more bits of info I purposefully omitted. It just might wet your appitite for more like it did me. Or go online and find it! You will not regret it.Even if your not a movie fan or a filmbuff chances are you will enjoy this film! This entry was posted in Movies, Reviews by illiilli. Bookmark the permalink.